My decision to want to go into psychiatry probably precluded me even getting into medical school - the best summary of myself this far into my budding career is a large, voluminous mass of hair and its attached, usually black-clad body running around trying to do as much psychiatry as is possible without actually being a psychiatrist (yet). 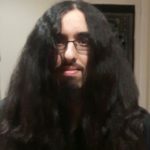 I spend my spare time writing about my own experiences with mental illness (dysthymia and recurrent depressive disorder), hitting guitars in an attempt to make nice noises come out of them and listening to heavy metal and rock music (I feel like that probably explains why I used the verb 'hitting'). Ahmed Al-Shihabi and Farhana Mann report on a recent twin study that explores the links between loneliness and sleep quality in young adults.